Millions of dead and millions more wounded, widowed and orphaned: the dizzying casualty tolls from World War One are an indication of the scale and horror of the 1914-1918 conflict. A lack of reliable statistics from the 52-month war a century ago makes the figures difficult to pin down, accounting for the sometimes substantial variations between historians. AFP has compiled the most widely accepted figures from the Great War, providing estimates in cases where major discrepancies remain. Even this figure is tricky, as many of the more than 70 current-day nations drawn into the conflict had not yet gained independence from the six empires and colonial powers at its heart: Austria-Hungary, Britain, France, Germany, Russia and the Ottoman empire. A dozen independent nations went to war at its start in 1914, the rest entering later, such as Italy in 1915 and the United States in 1917. Together the warring nations accounted for more than 800 million people, which was more than half the world's population at the time. Only around 20 countries across the globe were to remain neutral throughout the conflict, most of them in Latin America or northern Europe. About 20 million men were mobilised by the warring parties at the outset, the number rising to around 70 million as the war dragged on and expanded. 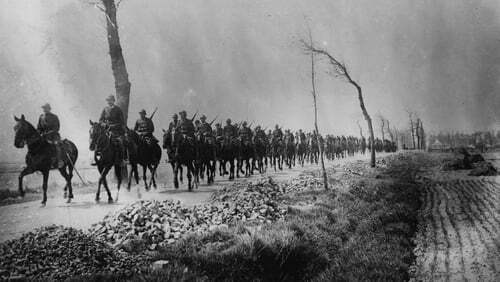 There were eight million soldiers from France, 13 million from Germany, nine million from Austria-Hungary and six million from Italy. Britain sent nine million men, including troops from around the British Empire, chiefly India. The United States deployed four million. Germany and Russia suffered the highest numbers of dead and wounded, with 10 million soldiers generally estimated to have been killed and more than double that number wounded overall. Serbia suffered the worst losses proportional to the size of its army with 130,000 dead and 135,000 wounded, or three-quarters of its forces. The opening weeks of the war exacted the heaviest human toll. For example, 27,000 French soldiers were killed in a single day on August 22, 1914, the deadliest day in the history of the French army. Artillery fire caused 70 percent of the casualties in the fighting, after which between five and six million men were left mutilated for life. The conflict saw the first large-scale use of chemical weapons when German forces deployed chlorine gas at Ypres in Belgium in 1915. Toxic gas eventually claimed 20,000 lives over the war. Between five and 10 million civilians are estimated to have been killed in the war and its consequences, which were many and make a precise figure difficult to establish. The toll generally includes those killed in the actual fighting as well as from the resulting forced displacements of populations, famine and the subsequent civil conflicts in Russia, eastern Europe and Turkey. Some historians include the disputed figure of 1.2-1.5 million Armenians massacred in the Ottoman empire. A Spanish influenza epidemic that broke out at the end of the war then spread across the world claimed tens of millions of lives in Europe. - There were six million prisoners of war. - By 1915 about 20 million civilians were living under the occupation of Germany, Austria-Hungary and Bulgaria. Most were in Belgium, France, Poland and Serbia. - The war left 10 million refugees across Europe. - And three million widows and six million orphans. - Around 1.3 billion shells were fired during the conflict. - About 10 billion letters and packages were exchanged between fighters on the front and their loved ones back home. - The war is estimated to have cost the main parties the equivalent of three or four times the combined GDP of its European players, who were left ruined by the conflict.